The Shop Cac 5989400 Wet Dry Vacuum includes 7′ x 1.25″ hose, (3) extension wands, 10″ wet dry nozzle, Gulper nozzle, crevice tool, cartridge filter, foam sleeve, and filter bag. This unit features a top carry handle, a stainless steel tank, a rear blower port, an onboard cord and accessory storage area and is proudly made in the USA. If power and durability are an important feature to you when it comes to a wet/dry vacuum then this may just be the one for you. Extremely versatile in what you can do with this. Great for cleaning out vehicle. 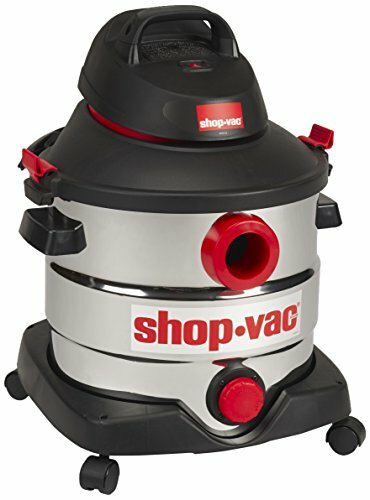 We use our Shop Vac 5989400 Wet Dry Vacuum around the house for dog hair, I cannot imagine having a dog that sheds and not having one of these vacuums. You cannot beat the price and value of this unit. These last forever and will not let you down.